NAPLES—G-NG’s Trent Overcash and Scott Lynch put the first 12 points on the board, when their boys dropped in on Lake Region on Friday night, Sept. 28, but the Lakers got their bearings after that – and surged. Hard. LRHS quarterback Ethan McMurray ran for four TDs and threw for one more as the home team exploded for 35 unanswered points and their first W of the autumn. G-NG dominated the action early. Overcash made it 6-0 for the Patriots near the start of the first quarter, reeling in a pass TD – a deep throw to the left corner of the LRHS end zone – from QB Connor Myatt. From there, the team continued to pressure. 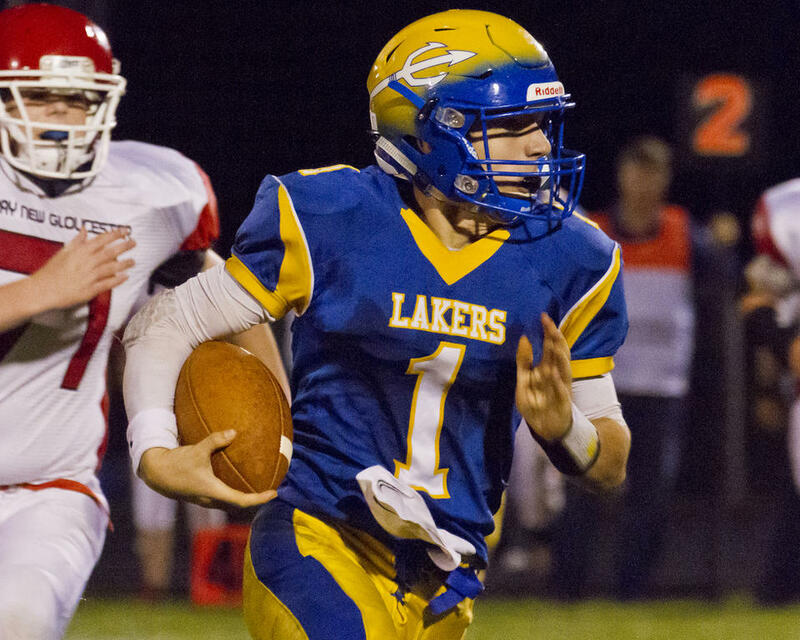 G-NG added six more points in the second, for 12-0: The Pariots worked forward from first and 10 at the Lakers’ 28 on short runs by Myatt, Lynch and Gabe Gendreau, eventually arriving at third and three at Lake Region’s 10; Lynch capped the drive with a hustle up the middle and over the goal line. 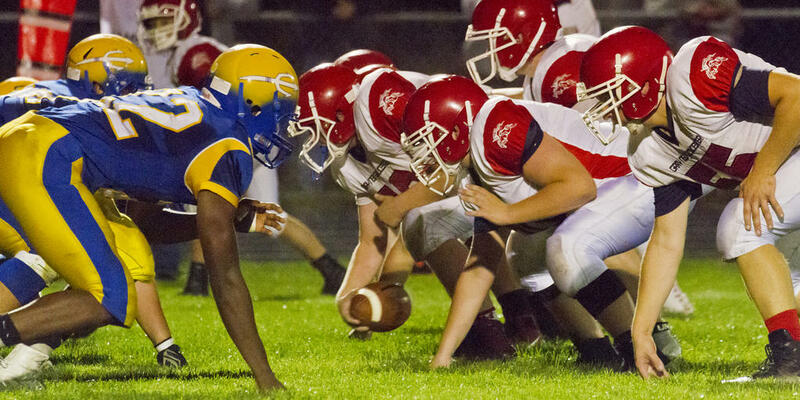 G-NG played a good deal – perforce, maybe, as their bench was quite short – of old-fashioned ground-and-pound football over the course of the evening, attempting to string together short runs up the side and the middle. Of course, that becomes predictable after a while; still, it’s not necessarily easy to stop. G-NG’s scoring dried up after their initial explosion, while the Lakers’ kicked into high-gear. What had looked destined to end in a Patriots blowout of LRHS turned into precisely the opposite. Lake Region tallied their first points midway through the second quarter. The team barreled ahead from first and 10 at their own 45 on McMurray runs of 16, 13, and 10 as well as a Bill Austin run of 15. That set them up just on G-NG’s doorstep, and McMurray completed the assault with a one-yard hop into the end zone. 12-6. The Patriots fumbled a few plays into their follow-up series, and Lake Region recovered, cranking their morale up another notch. They proceeded to assemble yet another overhwhelming drive: McMurray broke away right from first and 10 at LRHS’s own 40 for a 40-yard sprint. Isaac Rawson contributed an 11-yard run after that, advancing the Lakers to first and goal at the Patriots’ nine. Brandon Sargent added five before McMurray missed a snap; he recovered the loose ball nimbly enough, but the team fell back to the nine again. Third and goal. Happily, the missed snap hadn’t throw McMurray off one bit, and he immediately carried the ball home for 12-12, then successfully completed a two-point conversion attempt to seize the lead. Lake Region never trailed again, and hashed the game’s last 21 points. Paul Vigna, Brent Massey (with a brilliant broken tackle for nine additional yards), McMurray and Sargent combined to push the Lakers out front 20-12 early in the third, with McMurray doing the touchdown honors on a 10-yard scurry. Late in the same quarter, McMurray picked up his fourth score of the night on a 38-yard breakaway up the right side. Sargent converted for two. Finally, midway through the fourth, McMurray hooked up with Chase Weese for a 54-yard pass tally. Vigna split the uprights for the 35-12 final. Despite the loss, a number of G-NG players deserve credit for fine efforts. 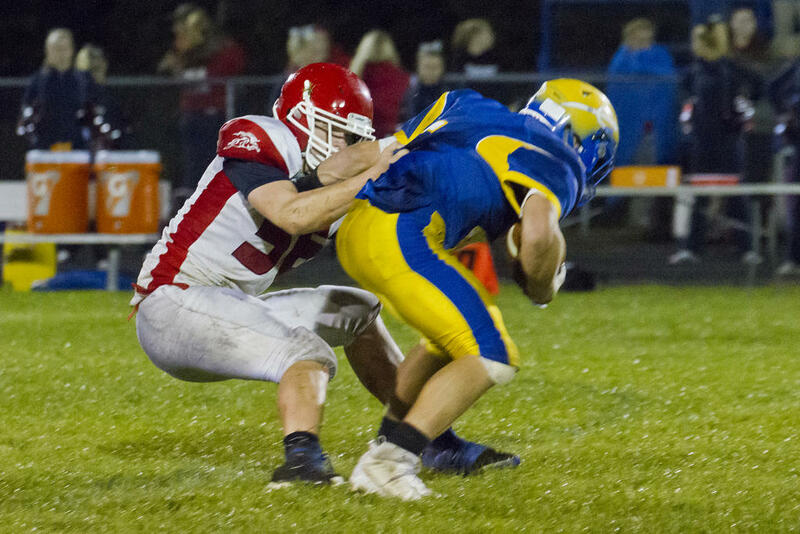 On defense, Mikey Foster, for instance, recorded numerous huge tackles and pressured McMurray heavily. McMurray, it’s important to note, also snagged an interception in the game, grabbing a pass attempt from Patriots’ QB Andrew Topham to Gendreau in the late third. The loss dropped G-NG to 0-5 on the season. The Patriots, who sit in last place in C South at the moment, opened their schedule with a 41-9 loss to Yarmouth (currently ranked seventh in the same division, at 1-4); they subsequently fell 22-8 to Dirigo (second in E South, 4-1), 33-6 to Old Town (ninth in C North, 2-3), and 49-14 to Morse (fifth in C South, 3-2). 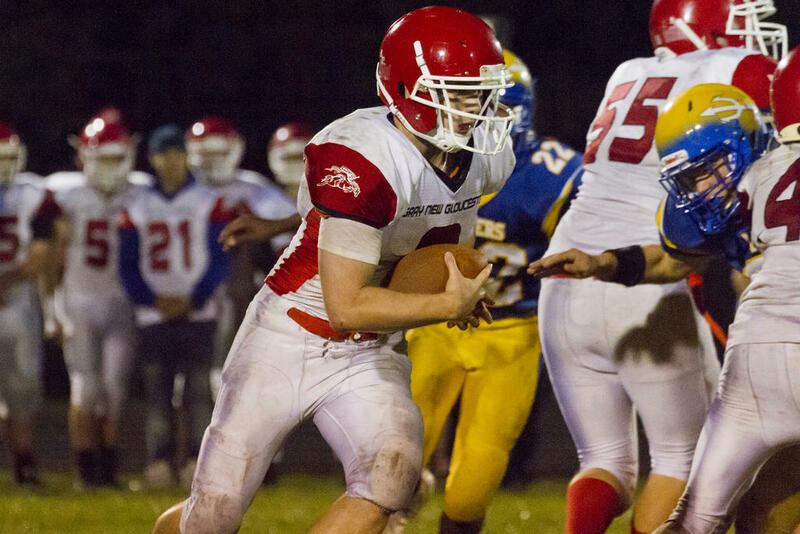 G-NG gets their next shot at a W on Friday, Oct. 5, when they travel to Maranacook (fourth in E South, 3-2). Brent Massey carries for the Lakers in their big win over G-NG. 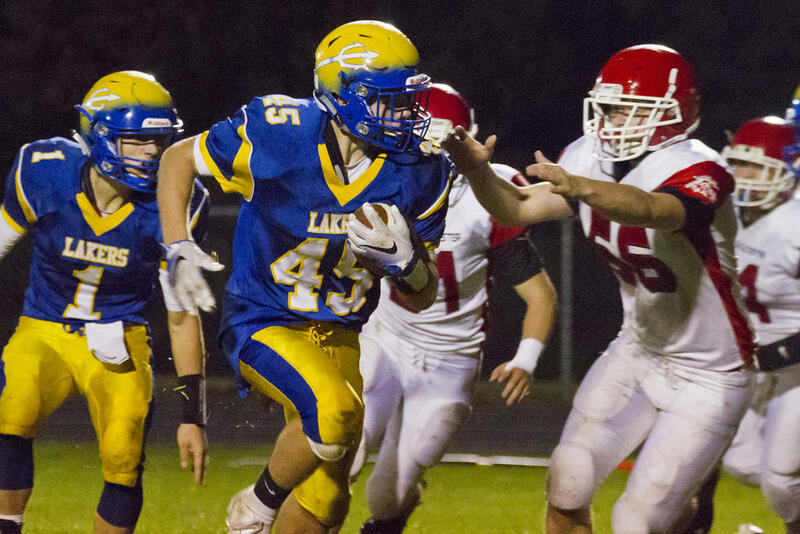 Laker Ethan McMurray turned in an explosive performance in his boys’ defeat of G-NG on Friday. Connor Myatt carries a QB keeper for the Patriots. 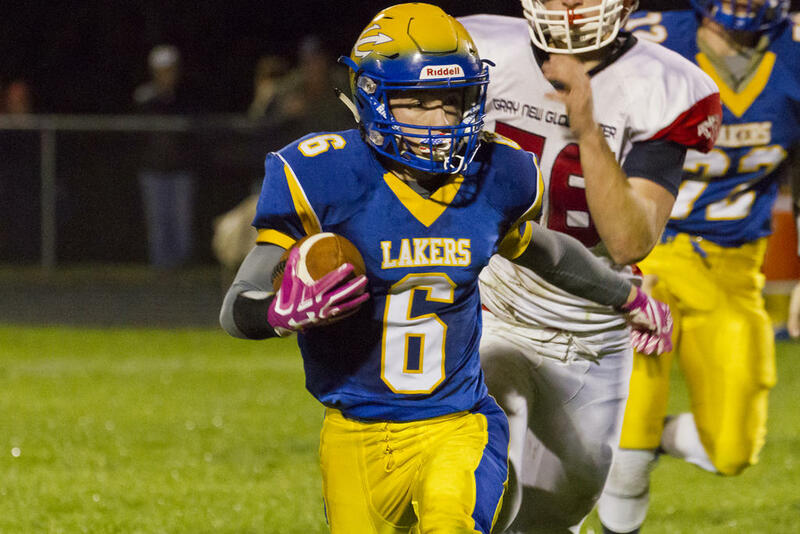 Brandon Sargent logged a number of key plays on both offense and defense for the Lakers. 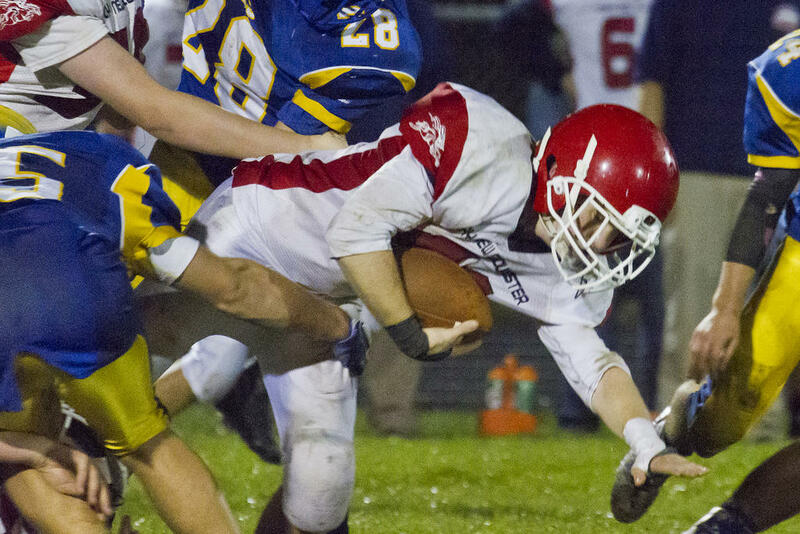 G-NG’s Mikey Foster wraps up and takes down a Lake Region ball carrier. Scott Lynch dives through the middle for extra G-NG yardage. G-NG lines up and snaps on the attack.